Cineworld Group plc is the world’s second largest cinema chain, with 9,538 screens across 793 sites in 10 countries: the US, the UK, Ireland, Poland, Romania, Israel, Hungary, the Czech Republic, Bulgaria and Slovakia. The group’s primary brands are Regal (in the US), Cineworld and Picturehouse (in the UK & Ireland), Cinema City (throughout Europe) and Yes Planet (throughout Israel). Cineworld is currently the leading cinema operator in the UK by box office market share (based on revenue), with 99 cinemas and over 1017 screens, including Ireland’s single largest multiplex by screens and customer base. 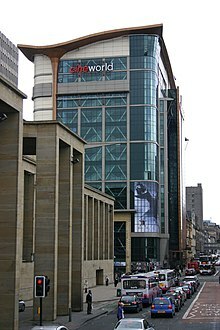 Cineworld Glasgow Renfrew Street is the tallest cinema in the world and the busiest, by customer base, in the UK. The Cineworld site with the greatest number of screens is located at Valley Centertainment in Sheffield, which has 20. It is listed on the London Stock Exchange and is a constituent of the FTSE 250 Index. Cineworld was established by Steve Wiener, an American, with other co founders including Ian Johnston who devised the name along with the support of private equity funds in 1995. They opened the first Cineworld in Stevenage, Hertfordshire in July 1996; the second, in a purpose-built location in Wakefield, West Yorkshire, followed in December 1996, with Shrewsbury, Shropshire, following in December 1998. After opening more sites over the next few years, Cineworld also took over the UK and Ireland operations of French cinema company UGC in 2005. In December 2012, Cineworld acquired the Picturehouse Cinema chain, adding 21 cinemas to its portfolio, including The Little Theatre in Bath, Brighton’s Duke of York’s cinema, the Cameo, Edinburgh, the Phoenix in Oxford and the Ritzy Cinema in Brixton. The Blackstone Group, which had invested in Cineworld when it was privately owned, sold its entire remaining 20% shareholding in November 2010. In August 2013, The Guardian revealed that Cineworld employs 80% of its 4,300 staff on zero hour contracts. In October 2013, the Chester location was closed due to the landowner wanting to develop the land into a supermarket. In 2014 Cineworld's Picturehouse chain was subject to industrial action owing to its refusal to pay the London living wage to its staff. The workforce attracted the support of Eric Cantona. On 27 February 2014 Cineworld completed the takeover of Cinema City International N.V.. In what can be seen to be a partial reverse takeover, the Greidinger family (who owned a controlling 54% stake in Cinema City International) hold a controlling bloc as the largest shareholders in the enlarged company. In 2015, Picturehouse unveiled their new West End flagship site, ‘Picturehouse Central’, a 1,000 seat, seven-screen cinema on Shaftesbury Avenue near Piccadilly Circus in central London. In August 2016 Cineworld acquired six cinemas from Empire Cinemas, including the Empire Theatre in London's West End, and 4 other locations in Basildon, Poole, Bromley and Hemel Hempstead. Empire Newcastle was also acquired by Cineworld the following year. In November 2017, Cineworld began merger talks with the US theater chain Regal Entertainment Group. On 5 December, it was officially announced that Cineworld would buy Regal for $3.6 (£2.7) billion dollars. This will create the world's second largest cinema group. It will also allow Cineworld access to the US market, the largest in the world. According to the company's 2017 Annual Report, Cineworld aims to be ‘the best place to watch a movie’ by providing their customers with a choice of how to experience movies, with the latest audio and visual technology and a range of retail offerings, including 29 Starbucks outlets across the UK. Across the Cineworld estate there are seven different ways in which their customers can watch a movie: 2D, 3D, 4DX, IMAX, Superscreen, VIP and ScreenX. Prices are set according to the format the customer chooses, and not the movie they choose. As of April 2018, across the European estate there are 38 4DX screens, 35 IMAX screens and 12 VIP auditoriums. Out of 45 cinemas in the world that are fitted with IMAX with Laser projection systems, two are in the UK, both belonging to Cineworld, located in Leicester Square and Sheffield. In April 2018, IMAX And Cineworld Group signed an agreement to install 55 new IMAX with Laser experience in Cineworld and Regal IMAX locations. Cineworld has begun a trial of a premium cinema brand, The Screening Rooms. Located next to the Cheltenham cinema, The Screening Rooms offers considerably larger, leather seating, premium food, and 'table' service. Cineworld was the only cinema chain in the United Kingdom to operate a 'strict no food and drink policy' on items that have been bought elsewhere, but in November 2012 the food policy was changed and now states that "neither alcohol nor hot food may be brought onto the premises". In early 2014, Cineworld introduced an allocated seating system, starting as a trial in selected sites including Wembley and rolling out to all their cinemas by the summer. The move was controversial and a Twitter campaign was created against this policy. Cineworld have responded to the criticism stating that it gives customers peace of mind along with other benefits. Cineworld continues to expand and enhance their estate, with an extensive ongoing build and refurbishment programme. In 2017, the company opened nine new cinema locations with a total of 109 screens; four of which were in the UK and five in the rest of Europe. A further 75 screens are scheduled to open in 2018 in addition. ^ a b c "Annual Results for year ended 31 December 2018" (PDF). Cineworld. Retrieved 16 March 2019. ^ Lang, Brent (13 March 2019). "Gary Barber Teams With Lantern Entertainment to Launch Spyglass Media Group". Variety. Retrieved 13 March 2019. ^ "UK's Cineworld on track to complete Regal deal in March". Reuters. ^ "Cineworld Group plc". cineworldplc.com. Retrieved 17 December 2016. ^ "Cineworld to buy Regal cinemas in blockbuster deal". bbc.co.uk/. BBC. ^ Nair, Arathy S. "UK's Cineworld targets U.S. expansion with $3.6 billion deal to buy..." U.K. Retrieved 21 May 2018. ^ "Cineworld reports surge in revenue thanks to films like Beauty and the Beast and Dunkirk". The Independent. 15 March 2018. Retrieved 21 May 2018. ^ "Cineworld Group plc Annual Report and Accounts 2017" (PDF). Cineworld PLC. ^ "€24 million for largest cinema in Ireland". The Irish Times. Retrieved 21 May 2018. ^ "Cineworld and its founder: nine things you did not know". cineworldplc.com. Retrieved 26 March 2015. ^ "Cineworld Group plc – About us". cineworldplc.com. Retrieved 26 March 2015. ^ "Cineworld founder Steve Wiener leaves to 'enjoy fruits' of cinema operator's success". 20 November 2013. Retrieved 16 April 2017. ^ "Cineworld Cinema – Stevenage". Cinema Treasures. Retrieved 16 April 2017. ^ "Cineworld Cinema – Wakefield". Cinema Treasures. Retrieved 16 April 2017. ^ "Cineworld Cinema – Shrewsbury". Cinema Treasures. Retrieved 16 April 2017. ^ "Cineworld clear to buy exhib UGC". Variety. 28 October 2005. Retrieved 16 April 2017. ^ "Cineworld buys Picturehouse". The Guardian. 6 December 2012. Retrieved 16 March 2019. ^ "Blackstone closes the curtains on its interests in Cineworld". The Times. Retrieved 16 April 2017. ^ Simon Neville. "Curzon and Everyman cinema staff on zero-hours contracts | Film". The Guardian. Retrieved 25 June 2014. ^ "Chester's only remaining cinema to close next month". Chester Chronicle. 22 September 2013. Retrieved 16 April 2017. ^ Spanier, Gideon. "Backers pile pay pressure on Cineworld over Brixton Ritzy row". London Evening Standard. Retrieved 24 June 2014. ^ "UK group to merge with Cinema City International". Polskie Radio. Polskie Radio. 10 January 2014. Retrieved 10 January 2014. Under the terms of the deal, Cineworld will purchase about 100 multiplexes from CCI for 503 million pounds. However, CCI will maintain a 24.9 percent stake in the combined business. ^ "Israel's Mooky Greidinger Agrees To Sell Cinema City Chain of Movie Theatres To UK Based Cineworld For $923 Million in Cash And Stock". Jewish Business News. Retrieved 26 March 2015. ^ "Picturehouse to launch new West End cinema". Screen Daily. ^ "Cineworld completes $124m deal for five Empire cinemas". Screen Daily. ^ "IT'S A WRAP". Empire Cinemas. ^ "Leading film markets worldwide in 2017, by gross box office revenue (in billions U.S. dollars)". Statista. ^ "Cineworld to buy Regal cinemas in blockbuster deal". BBC. Retrieved 5 December 2017. ^ "Forget 3D... UK cinemas are going 4D bringing wind, rain and smells to moviegoers". Daily Star. ^ "Cineworld unveils new Superscreen in time for Star Wars: The Last Jedi". Coventry Live. ^ "LF Examiner - Search". LF Examiner. Cinergetics LLC. Retrieved 25 July 2018. ^ "IMAX launches laser projection system in UK – and it looks spectacular". What Hi-Fi. ^ "VIDEO: Cineworld Sheffield to introduce new IMAX laser technology". The Star. ^ "IMAX And Cineworld Group Sign Agreement To Install New IMAX® With Laser Experience In 55 Cineworld And Regal IMAX Locations". Business Insider. ^ "Sneak peek at Cheltenham cinema's luxury Screening Rooms". This is Gloucestershire. ^ a b Sethi, Anita (20 February 2008). "My mission to beat the great cinema food rip-off". The Guardian. Retrieved 11 December 2016. ^ "Cineworld Cinemas – FAQ". Retrieved 9 July 2011. Can I bring in my own food and drink? – Cineworld have a strict no food and drink policy. ^ "Cineworld Cinemas – FAQ". Retrieved 1 December 2012. 2.2 Alcohol and Food Policy: Neither alcohol nor hot food may be brought onto the premises. Only hot food bought on the premises may be consumed on the premises. Alcohol may only be purchased and consumed in Cineworld licensed bar areas or in licensed screens and licensing laws will be strictly enforced. ^ "Allocated seating is now available at your local Cineworld". Cineworld. Retrieved 26 March 2015. ^ "Allocated Seats Cine". twitter.com. Retrieved 26 March 2015. ^ "Allocated seating coming soon to Cineworld". Cineworld. Retrieved 26 March 2015. Wikimedia Commons has media related to Cineworld.